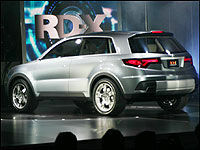 like the RD-X, introduced at the North American International Auto Show in Detroit last month. Granted, when we actually get a chance to drive one it probably won't have polished rosewood flooring or a steering wheel that looks something like a ceremonial Klingon weapon. 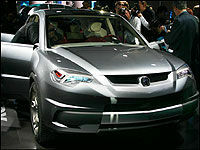 However, this particular compact SUV should be one to write home about when it finally hits the pavement. With over 200-horsepower promised, and an all-new light truck platform coupled to Acura's Super Handling All-Wheel Drive system, the RD-X should be a highly maneuverable SUV. the right amount of gritty industrial-strength toughness mixed with an upscale, classy matte finish. Through the gaps in the 5-star alloys it's possible to see the silver-painted Brembo calipers that complement a set of slotted rotors. Like a $2,000/month loft apartment with exposed concrete, 12-foot-ceilings and floor-to-ceiling windows, sometimes industrial chic can cost a pretty penny. While I like what I see, a lot, don't expect this entry-level premium SUV to boast such racy equipment when it arrives in retail form - at least in non-A-Spec guise.